Background: Morbid obesity is a growing problem in the United States. As a result, now more than 100,000 laparoscopic roux-en-y gastric bypasses (LRYGB) are performed annually. A large portion of these are performed at teaching institutions. This procedure carries with it known complications, the most feared, is a leak at the gastro-jejunostomy. Intraoperative endoscopy (IE) has been shown to increase detection of this problem so it can be corrected at the time of surgery. 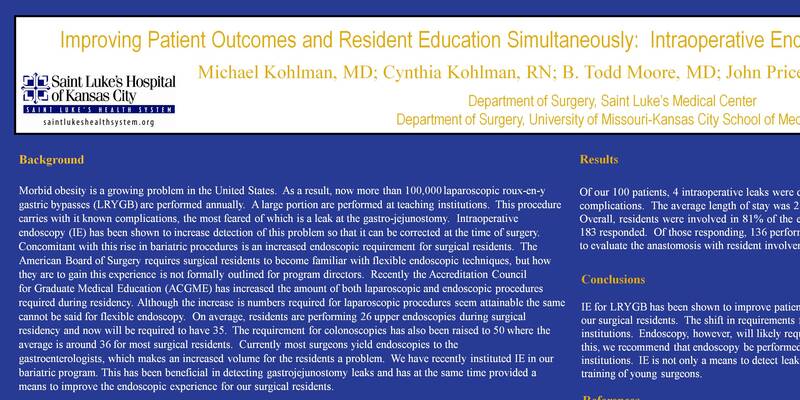 Concomitant with this rise in bariatric procedures is an increased endoscopic requirement for surgical residents. The American Board of Surgery requires surgical residents to become familiar with flexible endoscopic techniques, but how they are to gain this experience is not formally outlined for program directors. Recently the Accreditation Council for Graduate Medical Education (ACGME) has increased the amount of both laparoscopic and endoscopic procedures required during residency. Although the increase in numbers required for laparoscopic procedures seem attainable, the same cannot be said for flexible endoscopy. On average, residents are performing 26 upper endoscopies during surgical residency and now will be required to have 35 upper endoscopies. The requirement for colonoscopies has also been raised to 50 where the average is around 36 for most surgical programs. Currently most surgeons yield endoscopies to the gastroenterologists, which makes an increased volume for the residents a problem. We have recently instituted IE in our bariatric program. This has been beneficial in detecting gastrojejunostomy leaks and has at the same time has provided a means to improve the endoscopic experience for our surgical residents. Methods: Starting on September 25th 2007, our bariatric program initiated IE for our LRYBG patients. At the same time, resident participation was encouraged. A 12 month retrospective review of our database was performed. Results: Of our 100 patients who received LRYGB, 6 intraoperative leaks were discovered. These were corrected intraoperatively, with no post-op complications. The average length of stay was 2.33 days. Of the first 100 patients who had undergone LRYBG, residents performed the IE in 83 of those cases. Conclusion: IE for LRYGB has been shown to improve patient outcomes. In doing so, it has also provided needed endoscopic experience for our surgical residents. The shift in requirements for laparoscopic cases is a reflection on what is already being taught at most institutions. Endoscopy, however, will likely require a significant change at many programs to meet these requirements. Based on this, we recommend that IE be performed during LRYGB. IE is not only a means to detect leaks, but also improves the endoscopic skills and experience vital to the training of young surgeons.